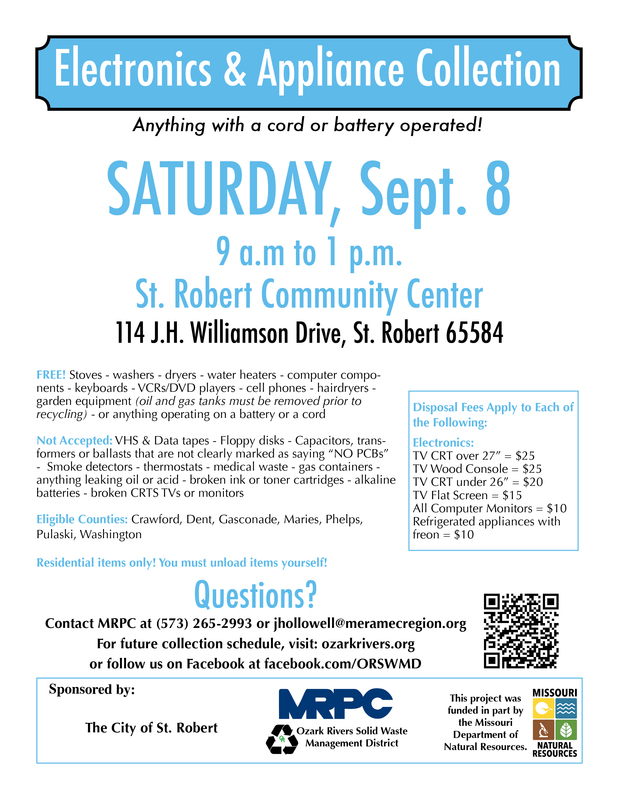 ROLLA—A special waste collection for electronics and appliances will be held from 9 a.m. to 1 p.m. Sept. 8 at the St. Robert Community Center, 114 J.H. Williamson Drive in St. Robert. The city of St. Robert and MRPC, with funding through the Missouri Department of Natural Resources (MDNR) and Ozark Rivers Solid Waste Management District (ORSWMD), are offering the Sept. 8 collection. The collection is for household items only – no materials from businesses will be accepted. Stoves, washers, dryers, hot water heaters and other appliances will be collected free of charge. Free electronics also include computer components, laptop computers, keyboards, hair dryers, VCR/DVD players, cell phones or anything that runs on a cord or battery. Oil and gas must be removed from tanks of any items such as push mowers, weed eaters, etc. Please note the following items will NOT be accepted: VHS & data tapes; floppy disks; transformers, capacitors or ballasts not clearly marked “No PCBs”; smoke detectors; thermostats; medical waste; gas containers such as propane, oxygen, nitrous oxide; anything leaking oil or acid, such as batteries; broken ink or toner cartridges; alkaline batteries; broken CRTS, TVs or monitors. Fees on certain items will be collected as follows: $25 for CRT TVs over 27 inches and wood console TVs, $20 for CRT TVs under 26 inches, $15 for flat screen TVs, $10 for all computer monitors and refrigerated appliances with freon. For more information on what is and is not accepted or the fee structure, please contact MRPC. Program participants are required to unload the items themselves. The collection is open to any households in the Ozark Rivers District, including Crawford, Dent, Gasconade, Maries, Phelps, Pulaski and Washington counties. The solid waste district is tasked with reducing the amount of waste that ends up in a landfill by 40 percent. For more information or questions, contact Jill Hollowell at MRPC at 573-265-2993 Ext. 109 or at jhollowell@meramecregion.org. For those unable to participate in the St. Robert collection, mark your calendars for another collection on Oct. 6 at the community park in Vichy. The Ozark Rivers District includes Crawford, Dent, Gasconade, Maries, Phelps, Pulaski and Washington counties and their respective cities with populations of 500 or more. The district’s strategy for solid waste reduction, which has been individually adopted by all member governments and approved by Missouri Department of Natural Resources involves education and to reduce solid waste in member counties and cities. MRPC provides administration of the district and assists with a variety of implementation projects. For more information about ORSWMD or waste reduction and recycling opportunities in the Ozark Rivers area, contact Tammy Snodgrass, MRPC environmental programs manager, at 573-265-2993 or by email at tsnodgrass@meramecregion.org. Additional information can be found at www.ozarkrivers.org or http://www.facebook.com/ORSWMD. Formed in 1969, MRPC is a voluntary council of governments serving Crawford, Dent, Gasconade, Maries, Osage, Phelps, Pulaski and Washington counties and their respective cities. A professional staff of 23, directed by the MRPC board, offers technical assistance and services, such as grant preparation and administration, housing assistance, transportation planning, environmental planning, ordinance codification, business loans and other services to member communities. To keep up with the latest MRPC news and events, visit the MRPC website at www.meramecregion.org or on Facebook at www.facebook.com/meramecregion/.